East to assemble (E2X) model rockets are not as simple to construct as Ready to Fly or Almost Ready to Fly models, which only take a few minutes to assemble, but they are designed to make it easy for the non-expert to build a flying model rocket in a relatively short period of time. Rockets in the Estes E2X range from snap together models, like the Estes Firestreak SST that takes just minutes to assemble, to models that will require more effort and take around an a hour to construct, like the Estes Bandito. 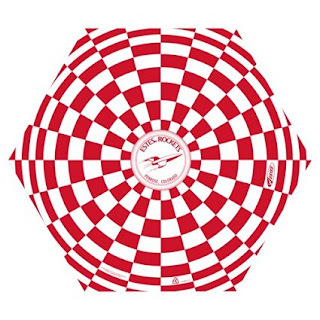 As a general guide, Estes Easy to Assemble Model Rockets will need no special tools or paint to complete the construction, assembly will take around one hour, and no real prior modelling experience is needed at all. The parts are already coloured and they are easy to put together. There will be some gluing with some models and you will need to apply the decals and assemble the various parts. Unless otherwise indicated, you will also need to have the appropriate launch equipment, including launch pad, launch controller and recovery wadding, and you will need to purchase the Estes rocket engines recommended for the particular model. Estes Easy to Assemble Model Rockets is a great way to get into the actual construction side of model rockets, without them taking too long to build. Typically, (E2X) models will take about an hour to build, but check the details of each model before you buy, because they do vary in complexity in this range. 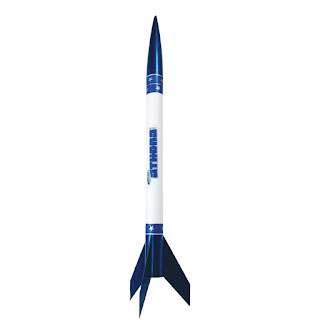 As an example of an Estes Easy to Assemble model rocket, the Estes Bandito has a pre-coloured slotted body and ready to fit parts. It will take approximately one hour to build and, when it’s finished, it will stand at just over 11 inches tall and it will reach heights of 600 feet. This particular example is a mini rocket, so it will require and Estes mini rocket engine and you will need a launch system and recovery wadding as well. For more information on what you will need to launch an Estes Easy to Assemble model rocket, please see Equipment Needed to Launch a Model Rocket. You can find a full range of Estes engines here. 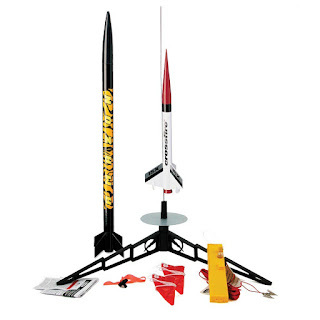 Rockets in this range are the ideal starting point for budding model rocketeers. They have just enough construction time needed to make it interesting, but not so much that you need to be an expert to complete the rocket. Rockets in this range are recommended for ages 10 and up, but please make sure that an adult supervises all those under 12 years old at the actual launch.